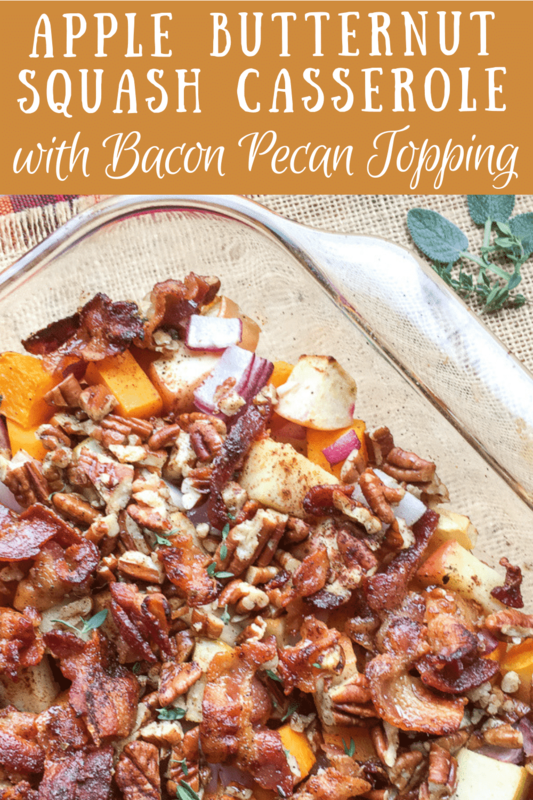 Apple Butternut Squash Casserole with Bacon Pecan Topping is a delicious mix of butternut squash, fresh apple chunks, bacon and pecans,all seasoned and roasted to autumnal perfection. I’ll admit that even I sometimes struggle to find sides to serve with main dishes. It can be easy to get in a rut of making the same sides over and over again. Luckily, this savory casserole is full-of-fall flavor! Even the pickiest of eaters will devour this delectable dish. Tip #1: Be sure to use firm apples, otherwise the apple chunks will get mushy when roasted instead of desired slightly crisp texture when roasted. Tip #2: You can adjust the flavor profile of this casserole based on the variety of apple you use. If you want a bit of tartness, use Granny Smith Apples. If you prefer a sweeter flavor, then use Honeycrisp, Jazz or Gala Apples. And if you’re looking for a neutral flavor, stick with Red Delicious Apples. When it comes to holiday meals, I rely on dishes that taste delicious, come together quickly, and than I can make in advance. 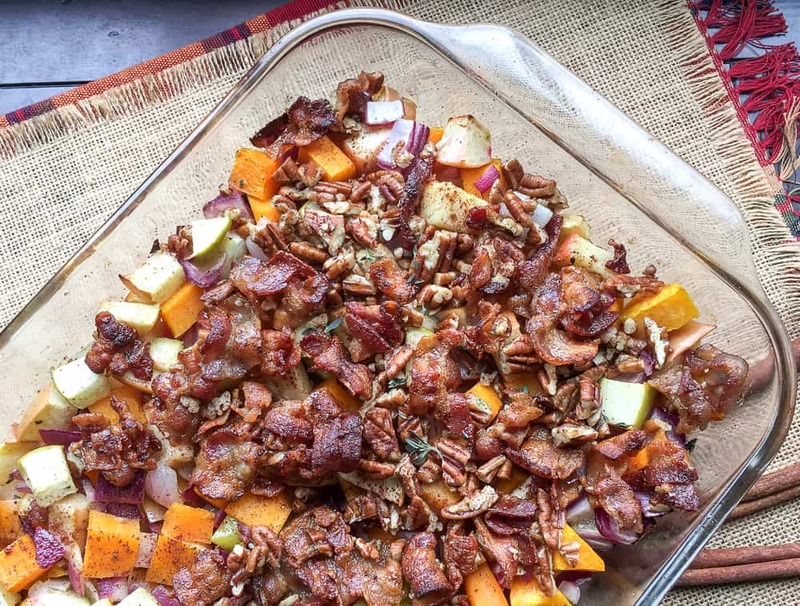 And Apple Butternut Squash Casserole with Bacon Pecan Topping is the perfect meal prep solution for all your holiday gatherings. To get ahead of the hustle and bustle, you can prepare the dish through step #4 several days in advance, cover it tightly and store it in the fridge. Then on the big day, pull it out and then reheat for 15-20 minutes before completing the remaining steps. So easy! Step#1: Preheat oven to 400°F and grease a 9×13” baking dish with 1 tablespoon melted coconut oil. Set aside. Step #2: Combine the butternut squash, apples, red onion, 2 tablespoons melted coconut oil, sage, and thyme in a large mixing bowl. Season with salt and black pepper to taste, and toss to combine. Step #3: Transfer the butternut squash mixture into the prepared baking dish and then spread into an even layer. Step #4: Place in the pre-heated oven to roast just until the butternut squash is fork tender, around 25-30 minutes. 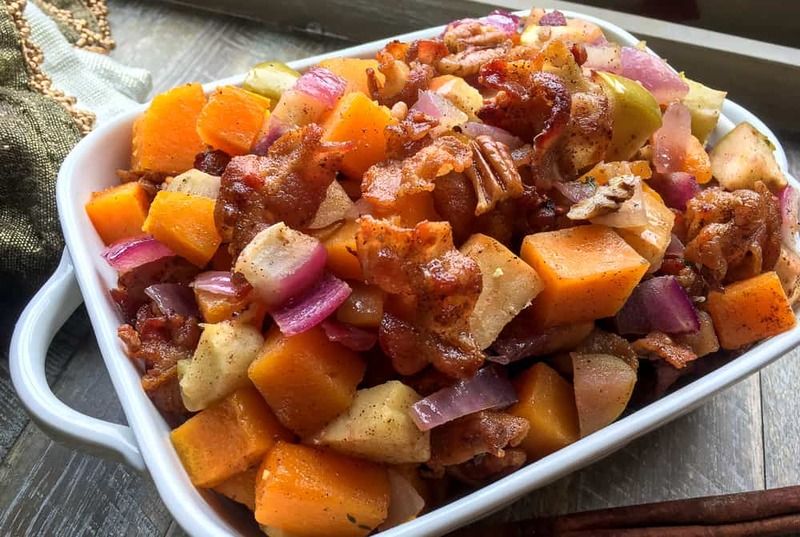 Step #5: While the butternut squash mixture is roasting, heat a large sauté pan over medium heat and add the bacon. Cook, stirring occasionally, until the bacon is cooked through and crispy, approximately 8-10 minutes. Step #6: Then transfer the bacon to a small mixing bowl lined with paper towels to absorb excess grease. Set aside to cool for 5-10 minutes. Step #7: Once cooled, discard the paper towels and add the remaining tablespoon of coconut oil, chopped pecans, honey, cinnamon, and ground cloves. Season with salt and black pepper as desired, and toss to combine. Step #8: Remove squash from oven and top with the bacon pecan mixture. Return to the oven until the topping is nicely browned, approximately 10 minutes. Step #9: Remove from oven and cool for 5 minutes before serving. Preheat oven to 400°F and grease a 9x13” baking dish with 1 tablespoon melted coconut oil. Set aside. Combine the butternut squash, apples, red onion, 2 tablespoons melted coconut oil, sage, and thyme in a large mixing bowl. Season with salt and black pepper to taste, and toss to combine. Transfer the butternut squash mixture into the prepared baking dish and spread into an even layer. Place in the pre-heated oven to roast just until the butternut squash is fork tender, around 25-30 minutes. While the butternut squash mixture is roasting, heat a large sauté pan over medium heat and add the bacon. Cook, stirring occasionally, until the bacon is cooked through and crispy, approximately 8-10 minutes. Transfer the bacon to a small mixing bowl lined with paper towels to absorb excess grease. Set aside to cool for 5-10 minutes. Once cooled, discard the paper towels and add the remaining tablespoon of coconut oil, chopped pecans, honey, cinnamon, and ground cloves. Season with salt and black pepper as desired, and toss to combine. Remove squash from oven and top with the bacon pecan mixture. Return to the oven until the topping is nicely browned, approximately 10 minutes. Remove from oven and cool for 5 minutes before serving. Enjoy!